LaTeX is a great typesetting system that produces publication quality mathematics, and it is free. However, creating table in LaTeX is not an easy task. Fortunately, there are some table generator exists for creating LaTeX table. One example is Excel2LaTeX. 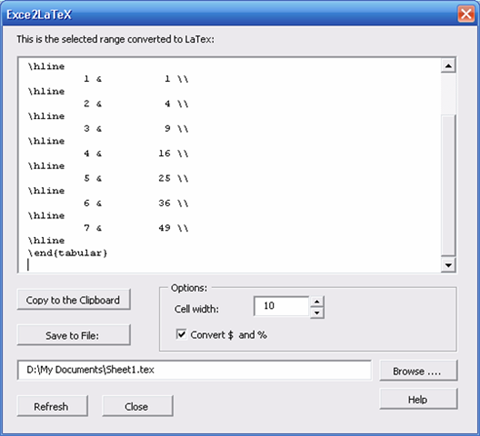 Excel2LaTeX is a free Microsoft Excel addin that allows you to transform the Microsoft Excel current selection into LaTeX code. Most of the formatting such as bold, italic, border lines, and multi column cells, will be preserved. The usage is very simple. First, create the table using Microsoft Excel. Second, highlight the table. Finally, click on the Excel2LaTeX addin button on the toolbar. The LaTeX code can then be copied to the clipboard, or saved as a LaTeX file. As a conclusion, creating table in LaTeX is not an easy task. However, the existence of LaTeX table generator such as Excel2LaTeX, will ease the problem.